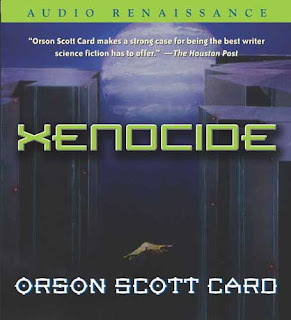 For me, Xenocide is a fun book. It's like the parable of the frog in cold water that will stay in while it heats up - the science fiction starts out pretty easy to swallow in Ender's game, and gets deeper and deeper through Speaker for the Dead and now Xenocide. It's off the charts in the next book. The thing is, I like where Orson Scott Card took it. He talks about philotic physics in Ender's Game, and again in Speaker For The Dead, but only as a way of communication. In this book, he delves deaper into it, including discussion on the nature of life, faster-than-light travel, the nature of the soul, unity or one-ness, and other things like that. The thing that I find secretly entertaining about it, though, is that what he's actually done is use some obscure Mormon scripture references about the nature of truth and intelligence and matter and make them a basis for the science fiction in the book. He says he wasn't serious about it, that it was just having fun, and that's what it is. I read criticism that he makes some logical leaps that remove it from real physics and put it into metaphysics, but honestly, it's fiction, people, and the grasp on physics as we know it was thrown away for Ender's game, let alone any sequels. What he has done, in my opinion, is make a universe where instant communication and travel are possible within the logic and rules of science in that universe, and where there's a scientific basis to believe in the soul. There is a storyline in the book - a few characters on a parallel world with Chineese culture - that bogs down for me a little, but fortunately, that is dropped after this book and the next one focuses on the root of the story, except for one character who comes from that world who is central to the next plot. SO I enjoy it, and it sets the stage for the next book which is also very fun, and wraps up the whole rebellion of Lusitania, and impending death of Jane storyline quite well.